Next Event - Churchill and the Bomb. 25th April @ 7.30pm in Shepherdswell Village Hall. In 1895, Dover Borough Council took a bold decision to build a tram system. The town’s power station was still unfinished and the Council was heavily in debt. 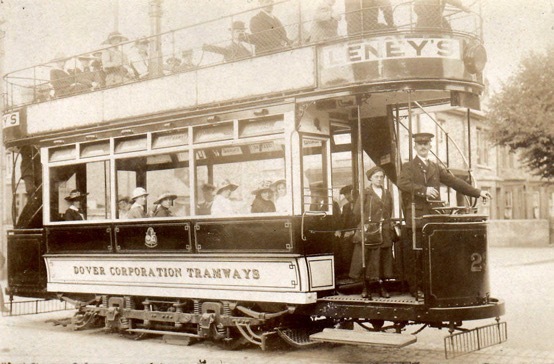 But the 1890s were a boom time for Dover and the trams attracted widespread admiration. It was, after Leeds, the second tram system built in the United Kingdom. The cheap tram fares made a dramatic difference in the lives of many ordinary Dovorians. In this talk, Brian Flood, Collection Manager of Dover Transport Museum, relates the 40-year history of the trams, bringing out many human stories, some funny and some deeply tragic. Join us on Thursday 28th February at 7.30 in Shepherdswell Village Hall for an entertaining presentation about how locals got around over 100 years ago!